Philip Challinor’s book superficially looks like the real deal: one in a series studying cult films that spotlights a single example, discussing its conception, content, reception and context. Except the film is called ‘I, Mengele’, the publisher is the British Regional Film Foundation (a co-ordinated regional subsidiary of the Reich Ministry for Public Enlightenment and Propaganda) and the context is a world where Hitler won World War II. This film is an epic blockbuster for an audience where The Final Solution is a reality and you had best make sure your ancestry holds up to scrutiny. There is nothing in the packaging to refute this. 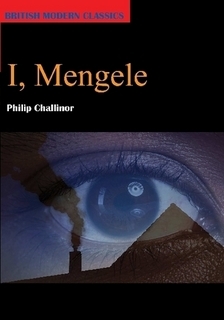 ‘I, Mengele’ (the faux-film) is a Josef Mengele biopic, which affords Challinor with plenty of jibes at the expense of the film business: pokes at ‘Schindler’s List’ and the fascist readings of ‘Lord of the Rings’, for example; there are jokes using others, such as Cronenberg’s‘The Brood’, and reinterpretations of classics such as Shelley's ‘Frankenstein’. All this in passing but spoken of in a manner familiar to any who reads about films and all of it false. Challinor has utilised alternative universes before, for example in ‘The Foundations of the Twenty-FirstCentury’ in which he uses the ghost story to highlight Nazi guilt. He is a writer that uses alternative realities to show the likely outcomes of certain political and/or religious agendas – a satirical tradition that can at least be traced back to Jonathan Swift’s ‘A Modest Proposal’ – perhaps most chillingly in ‘Security’. Like ‘Security’, ‘I, Mengele’ shows how language can assist in making the unspeakable justifiable and normal given another context – particularly in this medium of the film study whose very casual academic leanings surely makes what it leaves unspoken (a Nazi dominance) more unsettling. For example, he quotes from faux-film reviews from newspapers which indicate, through opinions, that the Third Reich’s doctrine has been assimilated into popular culture; but those dissenting views are simply other attitudes to the film. It soon becomes apparent that the black humour of ‘I , Mengele’ reveals something of how propaganda works, of how narratives help make all things palatable. For example, what at first might seem a gag at the expense of David Cronenberg’s ‘The Brood’[i] quickly fits into the body-horror that emerges through the plot of ‘I, Mengele’ where the enemy are literal monsters who do give birth to other literal monsters, and probably in monstrous ways. In this way, it is no mistake that Challinor makes this film a cross between biopic and fantasy epic, a natural progression from using fiction to make the enemy inhuman. By the time we reach the point where Mengele is regarding 'Frankenstein' and ruminating that one day it may be possible “simply to breed appropriate monsters for entertainment purposes and spare normal actors the inconvenience of heavy-make-up”, we are in a world where the Nazi vision of eugenics defines how this culture sees evolution. The plot of ‘I, Mengele’, apparently follows the troubled-and-flawed-but-ultimately-heroic-protagonist narrative. Troubled by what he sees as his own potentially degenerate gypsy features, Josef Mengele nevertheless gives all to the Fatherland with his experiments, at the expenses of his family. With this and descriptions of how the creators and industry make Mengel’s character fit more popularist dramatic and stereotypical forms, Challinor slyly makes us look at the tropes and narrative types that dominate culture and propaganda: perhaps we are left questioning the tropes that take what might be seen as heinous actions and makes them heroic. The book mocks mainstream cinema hubris whilst emphasising how it aids xenophobic stereotypes. Challinor’s conceit gets to show his more playful, sardonic side and the slender length means it is not allowed the chance to outstay its welcome. Right to the end, it keeps the quips coming (note the faux-bibliography that includes the book ‘Musn’t Grumble: The British War Film from Empire to Defeat’, for example). It is a scathing satire and a delight for those who read about film and fiction for fun. Darkly funny, scary, thoughtful and clever. [i] “…The Brood, a family film based on the story of Magda Goebbels and her children”: this is a satisfying gag parodying David Cronenbergs classic horror, itself a twisted version of those themes made popular by films such as ‘Kramer vs Kramer’; but it also infers the context where this is would not be a joke as well as containing a scornful criticism of Magda Goebels. At the time of writing, I thought of the reference to The Brood as a throw-away gag based on nothing more than the film's title and Magda Goebbels' enthusiastic self-conscription as a breeder of small Aryans; the resonances you've detected didn't occur to me at all. Your observations also remind me that Nola in the film allows the products of her family background to endanger and eventually poison her own child, while the real Magda Goebbels poisoned her thoroughbred children when the Red Army invaded Berlin. Thanks very much for the generous and thoughtful review. A lovely insightful review of what I reckon is - only just, mind - Philip's best work so far. It's a constant irritant to me that he's not far more widely known. It occurs to me now that Magda would not be considered a breeder of monsters, but anyway... Hmm, anyhow, Using "The Brood" fits the context of mutations. Yes, of all Philip's books that I have read beforehand I was a real fan of "Security", but I might agree with you Justin and consider this Philip's best work. It worked for me on multiple levels, which I hope my review conveys.